Shipping deals are always a nice deal! It's $2 Tuesday at The Baby Marketplace! That means you get $2 shipping on ALL orders to Canada and the US, for one day only - Tuesday April 6, 2010! 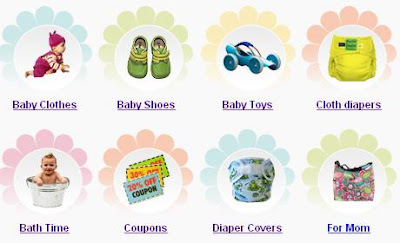 To get this deal, shop at www.TheBabyMarketplace.com and use discount code Ship-4-2 at checkout. The deal is only on TODAY, so shop now! With shipping deals, I like to pick up one or two regular-priced items that I have been watching; items that don't often go on sale. The Baby Marketplace has been my go-to store to purchase Bical Gripper shoes. 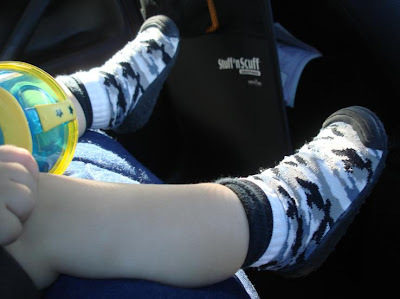 These are shoes that are like socks, and they will stay on your infant's feet - they were the only shoes that worked for my little guy when he first started to walk! 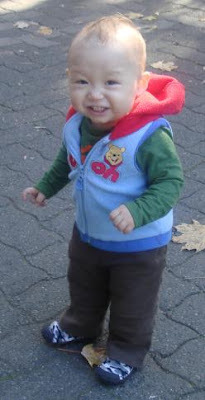 Here's a picture of him, very happy in his Bicals, in his early walking days. Bicals are durable and flexible, with a rubber sole that can be worn outdoors or use indoor as slippers so that baby doesn't slip around on the floors. You can also throw them in the washing machine, so they are easy to clean, too. The Baby Marketplace also sells plenty of other baby and mommy items, including a good selection of cloth diapers and accessories (new cloth diapering moms: they offer free shipping on diaper orders over $225 with code 'diapershipfree'. They always have items on sale, so check it out! Discount applies to regular shipping service to all USA and Canadian addresses. Offer Expires at midnight EST Tuesday, April 6, 2010. It's only a one-day sale, so shop now at www.TheBabyMarketplace.com and use discount code Ship-4-2 at checkout. 0 Response to "$2 Tuesday: $2 Shipping on ANYTHING at The Baby MarketPlace with Code"